After creating a Model Program resource, you should fill out the metadata on the resource landing page. The metadata fields for a Model Program Resource are different than those for other resource types. See below on editing metadata for a model program resource. 1. Select “Resource specific” which includes the specific metadata for the created resource. For the Model Program resource there are ten more metadata terms. 5. Under “Release Notes” select from the drop list the uploaded files related to the model release notes. 6. Under the “Release Date” insert the date of the software release which is 2015-04-30. 7. Under “Version” insert SWMM model version which is 5.1.009. 8. 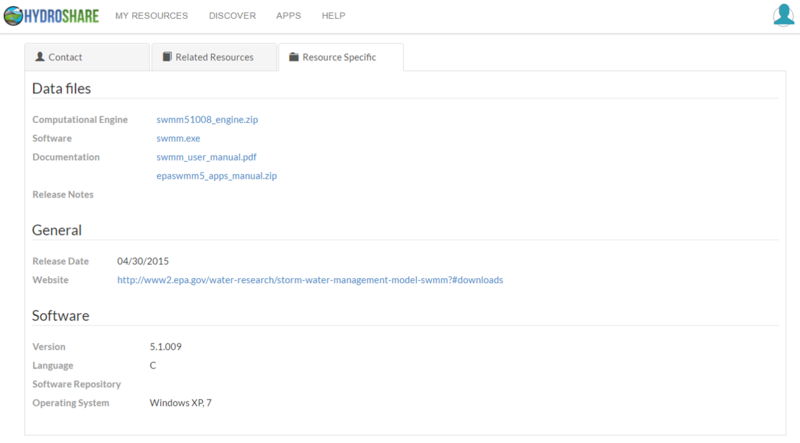 Under the “Website” insert a URL that provides additional information about the software which is http://www2.epa.gov/water-research/storm-water-management-model-swmm?#downloads. 9. Under “Language” insert the programming language(s) that the model was written in. In this case the programming language is C.
10. Under “Operating System” insert the compatible operating system with the hydrologic model which is Windows XP, and 7. 11. Under “Software Repository” insert a URL to the source code repository (e.g., Github, Bitbucket, etc.). The SWMM model does not have any. 12. Click “Save changes” button to save all entries. The first place is through the “Resource Specific” landing page.